1895 Mayo Cut Plug (N310)Joe Chonskia [sic]. Mayo produced a series of 35 subjects with photographic depictions of many of the biggest stars of the day. The set features two front styles: names at the top and names at the bottom of the image. 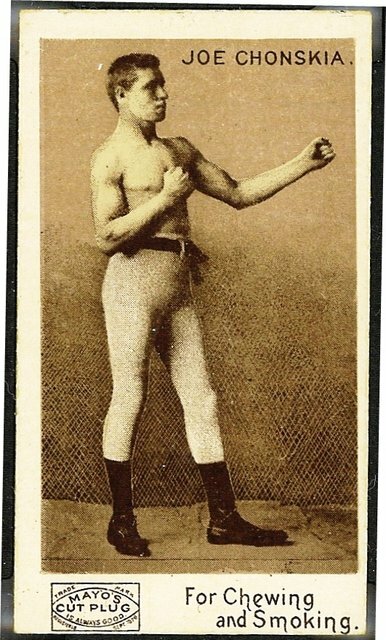 The fighter whose name was routinely mangled by the card companies, San Francisco native Joseph Bartlett Choynski [ko-yin-ski] was the first great Jewish-American fighter. Although he weighed about 170 he was a heavyweight who fought most every contender and champion, and defeated Jack Johnson early in Johnson's career.